Whether you constantly find yourself fumbling through your diaper bag for the diaper, wipes, or whatnots, or you feel stuck with diaper bags that never seem to match your look, a diaper bag insert offers you the perfect solution! Integrated with pockets and compartments, it helps you make organizing and locating stuff easy and keeps you looking on top of things. If you are confused which one to get, then check out this review on the MommyDaddy&Me Diaper Bag Insert Organizer and one alternative that will make the search easy for you. This diaper bag organizer has 12 partitions which you can use to organize a range of personal and baby stuff. It comes with six inner compartments that are great for feeding bottles, toys, diapers, wipes, and more. And if you need more, you can use the six outer pockets. They are perfect for keys, earphones, and wallets, among others. The dividers of the MommyDaddy&Me Diaper Bag Insert Organizer are not sewn in the bottom except for the center divider. The MommyDaddy&Me Diaper Bag Insert Organizer is made with a durable and waterproof fabric that is also easy to clean. Just wipe it with a damp cloth and let dry. Plus, it is soft yet firm enough to stand on its own. So, it conforms to the shape of your purse. This bag insert organizer comes with a removable strap that lets you convert it into a bag. The MommyDaddy&Me Diaper Bag Insert Organizer measures 11.8 x 7.9 x 6.3 inches, allowing you to use it with a range of bags. And weighing only 5 ounces, it makes for a lightweight yet handy addition in your purse. This diaper bag insert organizer is available in eight colors. Choose from a solid black, brown, burgundy, dark grey, dark pink, and red hue. It is also available in a polka dot design in black or brown background. Soft sides conform to the shape of the bag. Lets you convert your designer purse or favorite bag into a baby diaper bag. Wide color options afford you more chances of finding one that complements the lining of your purse. Or, you can always go for a basic black color. Saves you money from a new diaper bag that you will not be using a few years after. A zippered pocket would be a great addition. 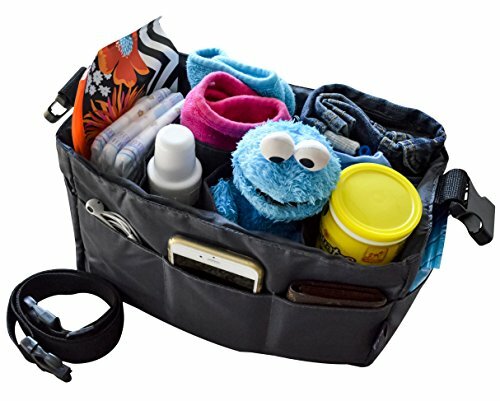 The MommyDaddy&Me Diaper Bag Insert Organizer is a 12-pocket bag insert that easily transforms your favorite purse into a diaper bag. And coming in with a removable strap, it lets you take your baby’s essentials from home to car to daycare in a pinch. It also comes in eight colors to choose from. Impressed with the MommyDaddy&Me Diaper Bag Insert Organizer? Do not be just yet. Check out first the KiloFly 2-in-1 Bag Insert and Stroller Organizer and decide which one you like better or prefer over the other. It shares many features with the product-in-review. For one, it comes with 12 pockets—six inner compartments and six outer pockets. And just like the MommyDaddy&Me Diaper Bag Insert Organizer, the dividers are not sewn into the bottom. Thus, the dividers are somewhat adjustable. In the same way, this feature can also be problematic if you put smaller items that can slide in between floating dividers. But then again, you have the six outer pockets to help you organize smaller and thinner baby articles or personal effects. Another feature it shares with the product-in-review is that it is waterproof and easy to clean. Remove stains or smudges with a damp cloth. But there are two features in the KiloFly 2-in-1 Bag Insert and Stroller Organizer that might make you go for it instead. One of those is the two attachable straps that go on each side of the diaper bag insert. While the product-in-review comes with a shoulder strap, this one comes with straps that transform it into a stroller organizer. Because of this feature, you no longer have to buy a separate stroller caddy. So you can go from home to car to stroller in a pinch. Additionally, the KiloFly 2-in-1 Bag Insert and Stroller Organizer comes with a top handle that you can’t find in the product-in-review. While not really a game-changing feature, it does afford you ease and convenience in putting the bag organizer in the purse and taking it out. Unfortunately, the MommyDaddy&Me Diaper Bag Insert Organizer beats this one out in terms of the design or color options available. This one offers you only three design choices: one all-black, one floral print, and the last one a combination of both. You should also take note that at 12 x 6.4 x 8 inches, it is slightly longer but not as wide as the product-in-review. And tipping the scales at 12.8 ounces, it is twice heavier. If you are searching for a well-made and fully functional purse organizer, then the MommyDaddy&Me Diaper Bag Insert Organizer is an easy choice. With its six inner compartment and six outer pockets, it transforms your favorite purse into a diaper bag without looking like it from the outside. And whether you are looking for a practical or fashionable solution to carrying out mommy or daddy duties, this bag organizer insert has got you covered. Plus, it lets you change bags in a pinch! And if you are all after ease and convenience, then just attach its removable strap, and you can take your baby’s essentials from house to car to daycare.